Thanks again for checking out Vivaldi! Want to get the most out of your new browser? You’ve come to the right place. Vivaldi is built with customisation and flexibility in mind – you should decide how your browser works, not the other way around. This guide will get you off to a flying start by showing you the basics. A Tab Stack is a group of tabs. It’s as simple as that. You can create them in a few different ways, but the easiest is to drag one tab on top of another until it becomes darker. Releasing it will create a Tab Stack. This is a great way to keep things organised (or cut down clutter when you have a huge amount of tabs open). Try creating your first Tab Stack – drag and drop some tabs together to see how it works! 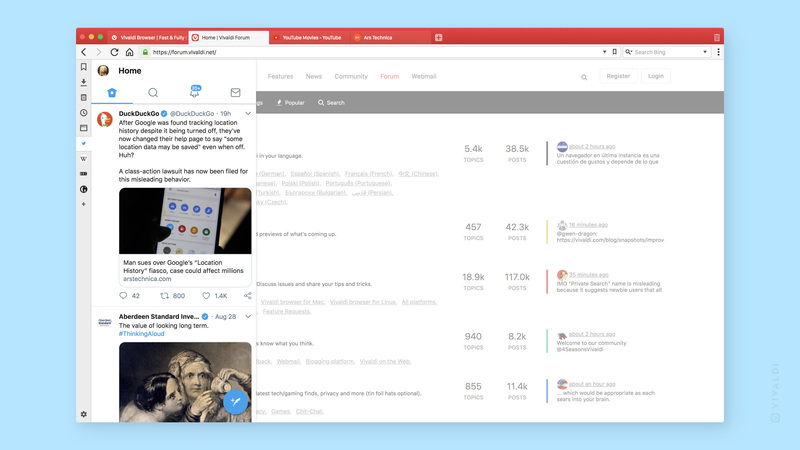 Vivaldi has a sidebar (or Panel as we like to call it) that includes a few tools you’ll be expecting (like Downloads, Bookmarks and History) and a few which may be a pleasant surprise. Web Panels are the latter. Web Panels let you add the mobile version of any site to the sidebar. This means you can keep your favourite messaging apps, news feeds or social media just a click away. Click the ‘+‘ sign in your sidebar and try adding a Web Panel like Twitter or Stack Overflow. Opening your newly created Web Panel will create a split-screen with the tab you have open in the main window. 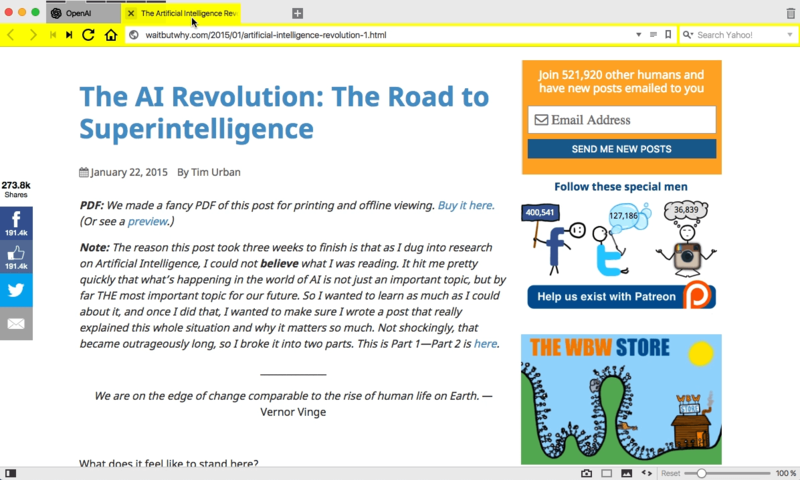 By default, expanding the side Panel of Vivaldi will resize the rest of your window to fit. To “float” your Panel over the main window (as shown in the screenshot above) go to Settings → Panels and tick the box marked “Floating Panel”. 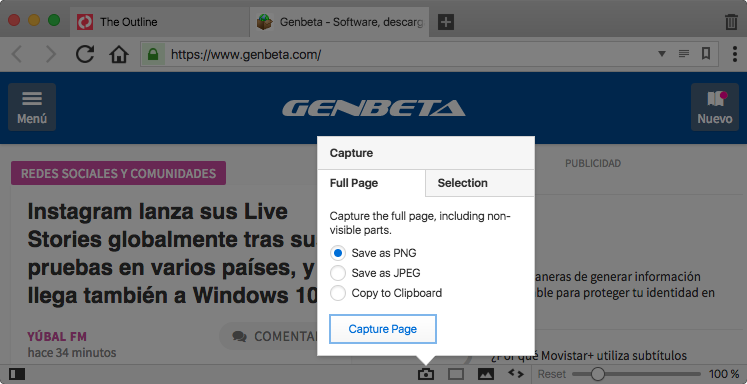 Vivaldi’s built-in Capture tool lets you capture either a Full Page screenshot, or a Selection of the screen . No extensions needed. As with most tools in Vivaldi, you can access Capture in a number of ways (for example with custom Keyboard Shortcuts or via Quick Commands). To begin with click the camera icon in your Status Bar to see your options. Choose whether to save your new pic to your computer or copy it to your clipboard for quick sharing and snap away. Keep reading this guide – Next up we’ll go deeper on a few key features. Watch video tutorials – Head to our YouTube channel for videos covering everything from how History works in Vivaldi to browsing multiple tabs at once. Join the Vivaldi Community – Get your very own @vivaldi.net email, create a blog, or weigh-in on the forum about Vivaldi and life on the web. #VivaldiTips – We post all kinds of quick tips, videos and gifs to social media on neat things you can do in Vivaldi. Follow us on Facebook, Twitter or Instagram if that’s your kind of thing. Check out the Knowledgebase – Read detailed info about all of Vivaldi’s features. Explore your Settings – It’s all in the details and there are plenty of things you can fine tune to get your browser feeling just right.